Visitors to the National Gallery can enjoy four exceptional Dutch and Flemish paintings, which are generous bequests to the collection from Willem Baron van Dedem. "We are honoured that the National Gallery acknowledges the quality and rarity of these four paintings that our father/grandfather collected over a period of more than fifty years It gives us great pleasure that the Gallery has decided to showcase these extraordinary works of art with the public." 'Christ crowned with Thorns' by David Teniers the Younger (1641), 'Butterflies, Moths and Insects with Sprays of Common Hawthorn and Forget-Me-Not' and 'Butterflies and Moths and Insects with Sprays of Creeping Thistle and Borage' both by Jan van Kessel the Elder (both 1654), along with 'Still Life with a Bowl of Strawberries, a Spray of Gooseberries, Asparagus and a Plum' by Adriaen Coorte (1703), are on display in Room 26 from 13 December 2017. 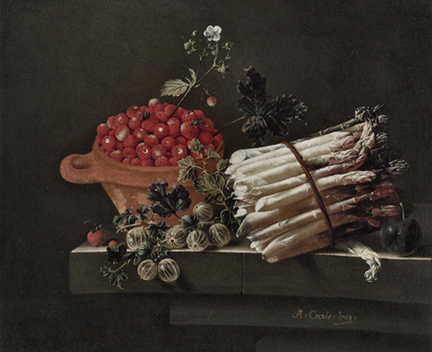 'Still Life with a Bowl of Strawberries, a Spray of Gooseberries, Asparagus and a Plum' (above) is one of Coorte’s most ambitious compositions. 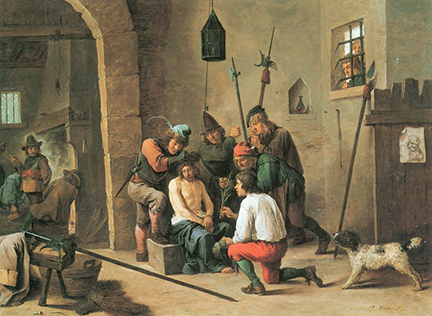 Coorte’s work is not represented in the National Gallery Collection, and there are only four other works by him in UK public collections, so this small but powerful painting is an important addition to the Gallery’s holdings of still lifes painted in the latter part of the 17th century. It also offers visitors an intriguing alternative to the lavish abundance of works by Willem Kalf or Jan van Huysum. 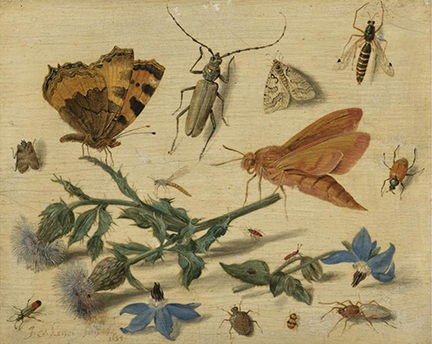 Jan van Kessel the Elder is another artist who until now was not represented in the National Gallery Collection. He belonged to one of the most famous artistic ‘dynasties’ in European painting: Jan Brueghel the Elder was his grandfather, and Jan Brueghel the Younger and David Teniers the Younger were uncles. 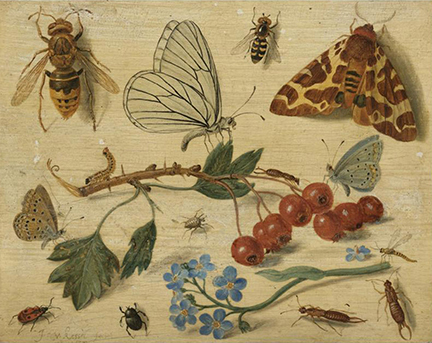 Van Kessel continued the family tradition of painting small-scale, brightly coloured and minutely detailed paintings on panel or copper, which were avidly sought after by collectors throughout Europe. He is best known for his depictions of flowers, insects and animals, both living and dead, as seen in his 'Butterflies, Moths and Insects with Sprays of Common Hawthorn and Forget-Me-Not' and 'Butterflies and Moths and Insects with Sprays of Creeping Thistle and Borage'. Few works represent so well the 17th-century fascination with the natural world. until the acquisition of this work it has not been able to represent the sort of intimate and finely painted representations of historical themes that formed an integral part of sophisticated collectors’ cabinets in the 17th century.